Plenty of intrigue still surrounds the July 2, 1937, disappearance of Amelia Earhart in the South Pacific on her way to completing an around-the-world flight. This article appeared two years prior to that fateful flight proclaiming the soundness (no pun intended) of her onboard radio. 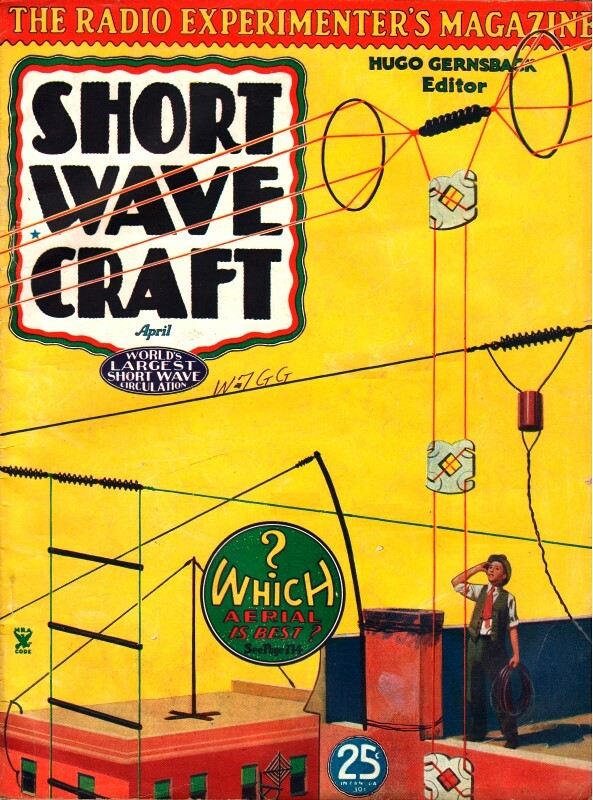 Back in the day, shortwave radio installations in aircraft required long wires trailing behind, particularly for long distance requirements like flying from the U.S. mainland to Hawaii. Those wires were a constant source of trouble due to destructive mechanical oscillations while waving in the airstream, airframe damage due to striking during the haul in/out procedure, and breakage. According to an article that appeared in the January 2015 edition of Smithsonian magazine, it is suspected that Earhart's antenna broke early in her flight and that is what was responsible for the loss of communication. Navy ships were tasked to monitor her progress and reported picking up spotty transmissions, but she never responded to messages sent to her. Interestingly, as the article explains, our political tensions with Japan at the time made it risky to make known the presence of fleet operations in the south Pacific. Earhart was a close friend of Eleanor Roosevelt, which undoubtedly had no small part in securing the Navy's assistance in the face of resistance from commanders. Fred Noonan was the guy that flew with her as navigator. If you or your girlfriend / wife would like to dress in authentic replica Amelia Earhart garb - and you have a lot of disposable funds - take a look at Phoenix Project. "The Phoenix Project is dedicated to recreating clothing worn by the world's most stylish icons." Très cool. 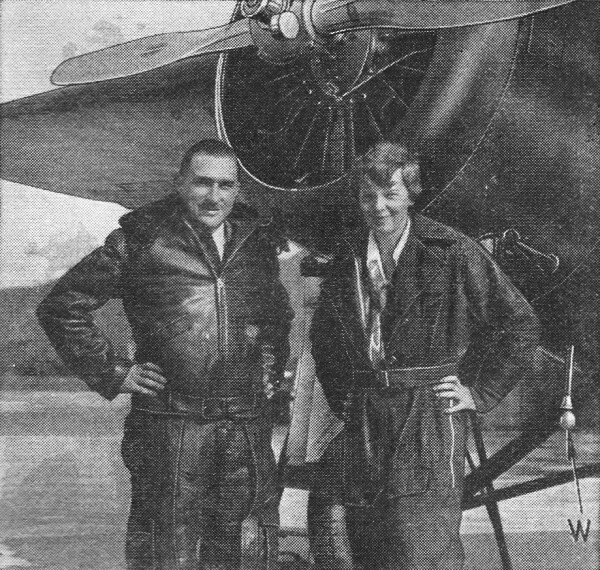 Miss Earhart and Paul Mantz, technical director of her transpacific flight. The famous red Lockheed plane. "W" indicates weight at the end of the trailing wire antenna which is lowered as required. 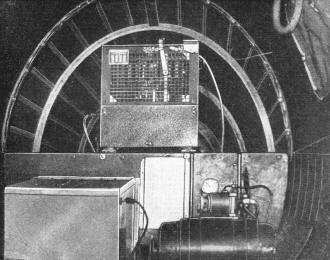 Special and extremely efficient radio sending and receiving apparatus was installed in Miss Amelia Earhart's plane before it left Burbank, where, at the Union Air Terminal, exhaustive tests were made before the Lockheed was shipped to the Hawaiian Islands on the Matson Liner, Lurline. In addition to a receiving set for beam flying, the plane carried a special transport airplane transmitter manufactured by Western Electric. Night frequency was 3105 kc., day, 6210 (96.66 and 48.28 meters). Power generated from an automobile-type generator to the engine in the nose of the plane, feeds a nest of storage batteries. These batteries lie near the radio apparatus located just aft of the fuselage door in the stern of the ship. The batteries deliver current to a Dynamotor which carries the current to the high tension crystal-controlled transmitter set. Call numbers of the plane are KHABQ. 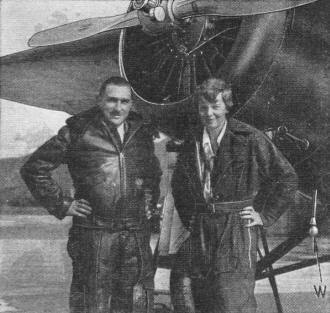 Tests made early in January by Paul Mantz, flying the Earhart plane 12,000 feet over Honolulu, carried his voice over the intervening 2,228 nautical miles of the Pacific to stations in California and Arizona and a broadcast message sent out by KFI acknowledged the reception immediately afterwards. Mantz received the return message through the headset as clearly as though he were in Los Angeles. The message from the plane was spoken into a new type of close contact microphone, which eliminates cockpit noises.